1.1 These Terms become effective when you complete the registration process for the UCount Rewards programme and accept them. 1.2 You must read these Terms (together with your Welcome Pack and the Programme Rules) and make sure that you understand everything. 1.3 You must, at all times, comply with these Terms as they are a binding agreement between you and us. 1.4	Important clauses, which may limit our responsibility or involve some risk for you, will be in bold and italics. You must pay special attention to these clauses. The singular refers to the plural and the plural refers to the singular. References to days refer to calendar days. Caltex Fuel Forecourt -means a participating Caltex Fuel forecourt from which you can Collect Rewards Points when using your Card to pay for your fuel purchases at any of their participating service stations in South Africa, and from which you can Redeem Rewards Points when using your UCount Rewards Card. Card(s) -means all personal Standard Bank Debit,Credit and Cheque Cards issued in South Africa, excluding Blue Bean Credit Cards, DinersClubCards, GarageCards, FleetCards,and any Co-branded Credit Cards. Channel - means the various options available to you and us to contact each other. These include, but are not limited to, our Website, the Contact Centre, our branches, email, SMS, MMS, telephone and post. Collect/Collecting- means the process by which you can collect Rewards Points when using your Cards. Collection/Collect Rate - means the rate at which we calculate the amount of Rewards Points that are credited to your Rewards Account, which is set out in the Programme Rules. Collection/Collect Cap - means the maximum amount of Rewards Points that you can collect from us in each Fixed Cycle, which is set out in the Programme Rules. Contact Centre - means the UCount Rewards contact centre that can be reached on 0860 826 868 between the hours of 08h00 and 17h00 from Monday to Friday and between 08h00 and 12h00 on a Saturday. FICA means the Financial Intelligence Centre Act, 38 of 2001, as amended from time to time and including subordinate legislation. Fixed Cycle means the period of time that runs from the 16th of the month until the 15th of the following month. Fraudulent Transaction means any transaction which, in terms of the laws of the Republic of South Africa, would constitute fraud, without it being necessary for us to prove such fraud. Good Standing - means that you are not in breach of any of your obligations towards us, all your accounts with us are up to date, not in arrears, dormant, or overdrawn and your accounts are FICA compliant or are considered to be in good standing for any other reason. Group means our affiliates, associates, subsidiaries and divisions together with our holding company and its subsidiaries and divisions. Participating Redemption Retailer means a list of retailers at which you can use your UCount Rewards Card to Redeem Rewards Points only. You cannot Collect points at these retailers. Participating Rewards Retailers - means a retailer from which you can Collect Rewards Points when using your Card to pay for goods or services at any of their stores in South Africa, and from whom you can Redeem Rewards Points when using your UCount Rewards Card.A list of Participating Rewards Retailers is set out in the Program Rules. Personal Information means information about an identifiable, natural, or where applicable, a juristic person, including but not limited to information about: age, biometric or medical information, birth, conscience, correspondence sent by the person that is directly or indirectly implicitly or explicitly	of a private or confidential nature, or further correspondence that would reveal the contents of the original correspondence, culture, disability, education, email, financial, criminal or employment history, gender, identity number, language, location, marital status, nationality, ethnic or social origin, online identifier or other particular assignment to the person, personal opinions, views or preferences of the person or of another individual about the person, physical or mental health, postal or street address, pregnancy, race, religion, belief, sexual orientation, symbol, telephone number, the name of the person if it appears with other	information, or if	the of the information will reveal information about the person; and well-being. PIN - means the confidential personal identification number used for operating your UCount Rewards Card. Primary Account - means your personal transactional savings, current or credit card account with us, used to participate in UCount Rewards. Process means any operation or activity, whether automated	or not, concerning Personal Information,including:alteration,blocking, collation, collection, consultation, degradation, destruction, dissemination by means of transmission, distribution or making available in any other form, erasure, linking, merging, organisation,	receipt,recording,retrieval, storage, updating, modification, or the use of information. Processing will have a similar meaning. Programme Rules - means the various rules applicable to UCount Rewards as set out in Annexure A of these Terms. Pro-Rated Refund - means the refund that you will receive for the unused portion of your annual or monthly membership fee when you cancel your UCount Rewards membership. Qualifying Grocery Purchases - means all perishable and non-perishable foodstuffs,	substances that	can be used to prepare food and all household cleaning products, beauty and health products that can be purchased from a Participating Grocery Retailer and excludes non- foodstuffs such as clothing, pharmaceuticals, tobacco, liquor, airtime, bill payments, lottery and casino purchases, travel and entertainment, gift cards, financial services, payments made for delivery charges and payments made to the Participating Grocery Retailer for payment of an account. Qualifying Purchase - means any purchase made from a Participating Rewards Retailer or Participating Redemption Retailer as well as fuel purchases from Caltex Fuel Forecourts and excludes pharmaceuticals, tobacco, liquor, airtime, bill payments, lottery and casino purchases, travel and entertainment, gift cards, financial services, payments made for delivery charges and payments made to a Participating Grocery Retailer for payment of an account. Redeem - means using your Rewards Points to pay for products and/or services at Participating Rewards Retailers, Participating Redemption Retailers, the UCount Rewards Online Mall,UCount Rewards Travel Mall, through the Contact Centre or at Caltex Fuel Forecourts. Retro (on your monthly statement of account) - means Rewards Points reflected that were collected from a transaction from a previous Fixed Cycle, to a maximum of two preceding Fixed Cycles. Rewards Account - means the UCount Rewards account that we will open for you when we approve your registration for UCount Rewards. 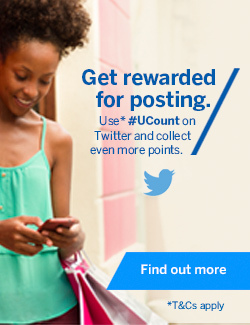 Rewards Points - means the points you Collect and Redeem within the UCount Rewards programme. Rewards Tier Points/Tiering Points - means the number of points that are allocated Tiering Points in a calendar month for a particular Rewards Tier Level, which is based on the banking products and services you use and your banking activity each month, as set out in the Programme Rules. Rewards Tier Level/Tiering Level - means the UCount Rewards tier that you qualify for based on the total number of your Rewards Tier Points, which is set out in the Programme Rules. Your Rewards Tier Level will determine your Collection Rate for the Fixed Cycle. Secondary Account - means the account that is created for your spouse, life partner or family member. Secondary Card - means the additional plastic card that is issued off your Primary Account. Spend Caps - means the total value of your qualifying Card spend during a Fixed Cycle that qualifies to Collect Rewards Points. Purchases exceeding the Spend Cap will not Collect additional Rewards Points from Participating Grocery Retailers or Caltex Fuel Forecourts. Standard Bank/we/us/our - means The Standard Bank of South Africa Limited. Tax - means any tax, duty, levy, fee, contribution, penalty, interest and any other charge under the Tax Administration Act No 28 of 2011, as amended from time to time. Terms - means the terms and conditions for UCount Rewards as set out in this document read together the Programme Rules. Third Party Vendor - means a pre-approved external vendor, Participating Rewards Retailer, Participating Grocery Retailer, Caltex Fuel Forecourt or Participating Redemption Retailer that provides services to us specifically for UCount Rewards. UCount Rewards - means the rewards programme offered to you by us that rewards you for your banking relationship with us. UCount Rewards Card - means the prepaid debit card issued to you when you join the UCount Rewards for Redeeming Rewards Points at Participating Rewards Retailers, Participating Redemption Retailers and Caltex Fuel Forecourts. UCount Rewards Online Mall - means an online facility where you can use your Rewards Points, a card or a combination or Rewards points and a card to buy various consumer goods and services. UCount Rewards Travel Mall - means an online facility where you can use your Rewards Points a card or a combination or Rewards points and a card to buy various travel-related products and services. Welcome Pack - means a step-by-step guide to how UCount Rewards work and the benefits you will receive once you have registered for the UCount Rewards programme. You/Your - means a Standard Bank customer who holds a Primary Account (in his or her individual capacity) and has registered as a member of the UCount Rewards programme. 3.3	We may accept or decline an application for registration and/or cancel your membership of UCount Rewards at any time, without giving reasons and without incurring any penalties. 3.4	We will inform you once we have approved your application. 4.1 You can cancel your UCount Rewards membership at any time by calling the Contact Centre. 4.2 If you cancel your membership and you apply to re-join UCount Rewards within 1 year of such cancellation, you will be charged a re-joining fee, which is set out in the Program Rules. 4.3	You may not grant a third party power of attorney to operate your Rewards Account. 4.4.1 Post – you will receive a full refund of your monthly or annual membership fee (whichever is applicable) if you cancel your membership within 21 days of registration. If you chose to pay your membership fee annually and cancel after 21 days, you will receive a Pro-Rated Refund, which will be paid into the account from which your debit order was processed. If you chose to pay your membership fee monthly and cancel after 21 days, you will not receive a refund. 4.4.2 Email – you will receive a full refund of your monthly or annual membership fee (whichever is applicable) if you cancel your membership within 7 days of registration. If you chose to pay your membership fee annually and you cancel after 7 days, you will receive a Pro-Rated Refund, which will be paid into the account from which your debit order was processed. If you chose to pay your membership fee monthly and cancel after 7 days, you will not receive a refund. 4.5	If you do not receive your Welcome Pack, either electronically or in the post, within 21 days of registering, please contact us so that we can resend it to you. 5.1 An account that is registered in two or more names will count towards your individual tiering calculation in keeping with the UCount Tiering Rules. 5.2 Secondary Accounts will not count towards your Rewards Tier Points. 6.1.4 using a Card to pay for Qualifying Purchases at Participating Rewards Retailers. 6.2 You will not Collect Rewards Points if you use a Card to pay for fuel purchases at a service station that is not a Caltex Fuel Forecourt. 6.3 UCount Rewards has been designed to reward you for using your Card in your personal capacity only. We are not liable for any losses or increased costs you incur as a result of you moving your business banking transactions to your personal account. 6.4 Rewards Points will be calculated retrospectively for the Fixed Cycle and allocated to your Rewards Account at the end of the month. 6.5 We may change the Collection Rate, Collection Cap or Spend Cap on 20 business days’ notice through one or more of our Channels. 6.7 Participating Rewards Retailers’ Collection Rates and rules are at the Participating Rewards Retailers’ discretion and may be changed on reasonable notice to you. 7.1.1 You must be in Good Standing with us to be able to Collect and/or Redeem Rewards Points. Whether you are in Good Standing will be determined on the last day of every Fixed Cycle. 7.2 Payment of membership fee – If you do not pay your membership fee for two months, you will not be able to Collect Rewards Points. We will advise you that you must pay your membership fee within 5 days, and if you fail to do so, we will cancel your membership of UCount Rewards and your Rewards Points will be lost. 7.3 Fraudulent Collecting of Rewards Points – If you Collect Rewards Points fraudulently or are a party to a Fraudulent Transaction, we may cancel your membership of UCount Rewards. All Rewards Points Collected fraudulently will be lost (forfeited). 8.1 All Rewards Points Collected are valid for five years from the date of issue. If you do not Redeem your Rewards Points before this time, they will expire. We will try to tell you in advance when and what portion of your Rewards Points will be expiring. 8.2 You cannot Redeem Rewards Points while you are not in Good Standing. If your Rewards Points expire while you are not in Good Standing, they will be lost. 9.1.4 by using the UCount Rewards Card only at Participating Rewards Retailers, Participating Redemption Retailers and Caltex Fuel Forecourts in South Africa. 9.3 You must present your UCount Rewards Card whenever you want to Redeem your Rewards Points at a Participating Rewards Retailer, Participating Redemption Retailer or a Caltex Fuel Forecourt. Refer to the UCount Rewards Card section below. 9.4 Payment at Participating Rewards Retailers, Participating Redemption Retailers and Caltex Fuel Forecourts can be made with a combination of both your UCount Rewards Card and a card. 9.5 For virtual Redemptions at the UCount Rewards Online Mall, we will send the voucher number to the cellphone number we have on record for you. 9.6 You cannot Redeem any Rewards Points if your Primary Account or any other products you hold with us are not in Good Standing. 10.1 Once you have registered and been approved for UCount Rewards, we will issue you with a UCount Rewards Card which you can use to Redeem Rewards Points. You can use your UCount Rewards Card to Redeem Rewards Points at Participating Rewards Retailers, Participating Redemption Retailers and Caltex Fuel Forecourts. 10.2 You must activate and create a PIN for your UCount Rewards Card on the Website or by calling the Contact Centre. If you request a PIN from the Contact Centre, the PIN will be sent to the cell phone number we have on record for you. 10.3 Your UCount Rewards Card will have an expiry date printed on the front of it and is valid until the last day of the month shown, unless your UCount Rewards Card is cancelled earlier than this by us. 10.4 You must sign your UCount Rewards Card in ink, in the space provided on the back, as soon as you receive it. Your UCount Rewards Card is not valid unless it is signed by you. 10.5 Your UCount Rewards Card can be used only at Participating Rewards Retailers, Participating Redemption Retailers and Caltex Fuel Forecourts in South Africa that accept the UCount Rewards Card. You cannot use your UCount Rewards Card for any other purpose. 10.6 We will always be the owner of the UCount Rewards Card. 10.7 You are responsible for the safety of your UCount Rewards Card and PIN. We will not be liable if your UCount Rewards Card is damaged, lost, stolen or copied. 10.8 You can view the Rewards Points Collected and Redeemed by logging onto your UCount Rewards profile on the Website. 11.1 When you use your UCount Rewards Card to pay for goods or services you must enter your PIN into the point-of-sale terminal. 11.2 You have three attempts to use your PIN, thereafter your Card will be blocked, and you will need to call the Contact Centre to get a new PIN sent to your registered cellphone number. 11.3 When you use your UCount Rewards Card to Redeem Rewards Points, we will process the transaction against your available Rewards Account balance. You will only be able to spend Rewards Points up to the value of Rewards Points in your Rewards Account. 11.4 You authorise us to deduct the full amount of each purchase from your Rewards Account whenever your UCount Rewards Card is used to pay for goods or services. 11.6 We are not responsible for any loss due to any failure or malfunction of electronic facilities or delay in point-of-sale device or our supporting or shared networks, where applicable, resulting from circumstances beyond our reasonable control. 11.7 No warranties, purchase protection, insurance, other promises or services are given by us. 11.8 Once you have paid for a purchase, you cannot stop the payment of the transaction. 11.9 You are responsible for keeping track of the transactions to ensure that you do not exceed your Rewards account balance. 11.10 You can Redeem a maximum of R20 000 worth of Rewards Points per month on your UCount Rewards Card. 12.1 Your UCount Rewards Card will be cancelled when it expires. We will automatically reissue you with a new UCount Rewards Card, if the accounts you hold with us are in Good Standing. 12.2 You must destroy your UCount Rewards Card as soon as it expires. 12.3 If your UCount Rewards Card is lost, stolen or damaged, you must cancel your UCount Rewards Card through the Website or the Contact Centre. You can order a new UCount Rewards Card through the Contact Centre. A card replacement fee, which is set out in the Program Rules will be charged for all replacement UCount Rewards Cards. 12.4 We may stop your UCount Rewards Card at any time, if necessary, to protect our interests. 13.1 You must keep your UCount Rewards Card and PIN safe. We will not be liable for any loss or damage you suffer in connection with any fraudulent activity or event that we have no control over, including if the PIN becomes known to a third party or if the UCount Rewards Card is damaged, lost, stolen or copied. Any Rewards Points that are Redeemed after the UCount Rewards Card or its details are lost or stolen will be lost. You must notify us immediately by calling the Contact Centre if your UCount Rewards Card, its details or the PIN are lost or stolen or any security measures we have put in place in connection with UCount Rewards have been compromised, and we will stop your UCount Rewards Card as soon as reasonably possible. 13.3 You will be responsible for all payments made with your UCount Rewards Card before it is stopped. 14.1 We will reverse any Rewards Points that you have Collected on any goods and services that are refunded on a Card. 14.2 If you do not have enough Rewards Points in your Rewards Account for us to reverse then your Rewards Account will go into a negative balance and we will reverse the remaining outstanding Rewards Points the following month. 14.3 If your Rewards Account has been closed or if after a month we could not recover the Rewards Points then we will recover the value of the Rewards Points from your Primary Account. 14.4 If goods or services purchased from a Participating Rewards Retailer or Participating Redemption Retailer on your UCount Rewards Card are returned, you will be refunded either with a voucher or gift card, whichever is applicable to the respective Participating Rewards Retailer or Participating Redemption Retailer. 14.5 All goods or services paid for with your Cards will follow our standard refund processes. 15.1 A membership fee, which can be paid either monthly or annually, is payable when you register for UCount Rewards and monthly or annually thereafter for as long as you are a member of UCount Rewards. The membership fees are set out in the Program Rules. 15.2 You will not be charged any fees when you pay for goods or services with your UCount Rewards Card. 15.3 You will not earn any interest on Rewards Points in your Rewards Account. 15.4 We will charge you a Card replacement fee if we have to provide you with a replacement UCount Rewards Card for any reason. 15.5 We will charge any applicable fees to your Primary Account from which the fees in connection with UCount Rewards are debited. 15.6 We may change the fees after giving you 20 business days’ notice. 16.1 You can ask us for a Rewards Account statement by calling the Contact Centre or checking your profile on our Website at any time. 16.3 If there are any errors on your monthly Rewards Account statement, you must call the Contact Centre within 60 days of the date of the statement, failing which we will consider it as correct and final. 18.1 Voluntary membership cancellation – You can cancel your membership of UCount Rewards by calling the Contact Centre. You must Redeem your Rewards Points before cancelling your membership, otherwise all un-Redeemed Rewards Points will be lost. you breach any of these Terms. 18.3.2 In the event of death, your account will be frozen. Your executor must provide us with a certifi ed copy of your death certifi cate and any other documents we may request. The executor may instruct us to transfer the Rewards Points to another member’s Rewards Account within 24 months of your death, failing which the Rewards Points will be lost. Any of your Rewards Points that expire during the 24 month period will be lost. Your account will be cancelled once the Rewards Points have been transferred or at the end of the 24 month period, as set out above, whichever is earlier. 18.4 All cancellations will take effect immediately. If you decide to re-register for UCount Rewards within 12 months of cancelling your Rewards Account, you will be charged a re-joining fee, which is set out in the Program Rules. Re-registration after 12 months will not incur any fees. 20.1 You can access your UCount Rewards profile by entering a username and password on our Website. 20.2 When logging on for the first time, you will need to enter your South African identity number or passport number in the ‘Username’ field. You will then be sent a One-Time Password and be asked to choose a username and password. 20.4 Your use of this Website is dependent on factors beyond our control, such as the network coverage or availability of your Internet service provider. We do not warrant that the Website is safe to use on any electronic device. We are not liable for any loss or damages you may suffer as a result of your use of the Website. When you contact the Contact Centre, you will only be given information on your Rewards Account or be allowed to Redeem Rewards Points if you answer the security questions correctly. If you believe that your UCount Rewards Card, its details, your UCount Rewards profile, your PIN, or any other security measures we have put in place, to protect your Rewards Account, have been compromised, you must call the Contact Centre immediately to report it. 23.2 You may opt out of any UCount Rewards marketing at any time. 24.1 You consent to us collecting your Personal Information from you and where lawful and reasonable, from public sources for credit, fraud, compliance and the purposes set out below. 24.2 If you give us Personal Information about or on behalf of another person (including, but not limited to, account signatories, shareholders, principal	executive officers, trustees and beneficiaries), you confirm that you are authorised to: (a) give us the Personal Information; (b) consent on their behalf to the Processing of their Personal Information, specifically any cross-border transfer of Personal Information into and outside the country where the products or services are provided; and (c) receive any privacy notices on their behalf. 24.4 You will find our Processing practices in the Group privacy statement and our privacy statements. These statements are available on our websites or on request. 25.2 Except as required by any applicable laws, we make no representations or warranties about UCount Rewards of any kind, express or implied, including any warranties as to fitness for a particular purpose. 25.3 Your dealings with Participating Redemption Retailers, Participating Rewards Retailers and Caltex Fuel Forecourts, including payment for and delivery of goods or services, and any other terms, conditions, warranties or representations associated with such dealings, are solely between you and such retailer. You agree that we shall not be responsible or liable for any loss or damage of any sort incurred as the result of any such dealings. 26.1 You agree to indemnify us against any loss or damage suffered by us as a result of our reliance on any warranty, representation or information given by you in relation to these Terms, your membership of UCount Rewards or your breach of these Terms or any applicable law. 27.1.3 any copy of the content or portion of it from any part of our Website shows our copyright notice. 27.3 You may not, without our prior written permission, use our intellectual property or that of a third party. 27.4 You may not establish a hyperlink, frame, metatag or similar reference, whether electronically or otherwise to the Website or any subsidiary pages without our prior written consent, which consent is at our sole discretion. 27.5 Even if any content on our Website is not confidential or there is no copyright in it, we own all of it and you have no rights in it. 28.1 We may at any time change these Terms after sending you reasonable notice in writing. 28.2 We will assume that you have received any notice we send you within seven days of posting, or on the same day if delivered by hand or sent by fax or email. 28.4 You agree that we may sue you in a Magistrate’s Court, even if our claim against you exceeds the jurisdiction of the Magistrate’s Court. 28.5 A favour or concession we may give you will not affect any of our rights against you. 28.6 You must pay all our expenses for recovering any amounts you owe us, including legal fees of an attorney at own client scale, collection fees and tracing fees. 28.7 A certificate signed by any of our managers (whose appointment need not be proved) showing the amount you owe us is sufficient proof of the facts stated on the certificate unless the contrary is proved. 28.8 These terms are governed by South African law. 28.10 Your telephone conversations with the Contact Centre, will be recorded and stored for record-keeping purposes for a period of five years. 29.1 You are responsible for any Tax chargeable and/or declared as a result of any Rewards Points Collected, transferred, ceded or Redeemed by you or a person that you represent. 29.2 Please note that we do not give any Tax advice. The contents of these Terms and the contents on the Website do not constitute Tax advice. 29.3 You are responsible for getting Tax advice from an independent, professional Tax advisor about any Tax chargeable or due to be levied and/or declared as a result of any Rewards Points Collected, transferred, ceded or Redeemed by you or a person that you represent as a result of your participating in UCount Rewards. 29.4.2 we are not responsible for any damages suffered or that may be suffered as a result of a Tax due by you in your personal or representative capacity, whether in common law or otherwise, including any legal practitioner and client fees, whether agreed to or as a result of a court order. 30.3 We are a member of the Banking Association of South Africa, which has appointed an independent Ombudsman for Banking Services (“Ombud”) to deal with complaints. 31.1	Your street address on your registration form is your chosen address for receiving any legal notices and documents. You must let us know immediately if your address changes. 31.2	The registered address on the www.standardbank.co.za website is our chosen address where any legal document must be served or delivered. 31.3	Any legal document or notice to be served in legal proceedings must be written on paper. The relevant provisions of the Electronic Communications and Transactions Act 25 of 2002 do not apply to these documents or notices.